[In] the matter of the estate of Elizabeth Hester Isabella Atcherley [ ], Widow, deceased […] late of No. 15, Cranbrook Road, Chiswick, in the county of Middlesex, widow of Lieutenant William Shairp Langton Atcherley [ ], who died on or about the 30th day of October, 1899 […] Note—The said Mrs. Atcherley had an only child, Henry Mount Atcherley [ ], who was last heard of in the year 1858 by a letter from Rangoon. – London Gazette, 25 February 1902. Notices in the London Gazette can furnish some fascinating family history facts. The one from which I have partially reproduced above is a good example, confirming the identities of both parents of Henry Mount Langton Atcherley, the date of his mother’s decease, and the fact that he had no siblings. Henry Mount Atcherley (he did not take his father’s third forename until later in life) was baptised at St Marylebone in Westminster (pictured left) on 30 August 1837. His father William was described as a “Lieut of Marines” and the family’s abode given as “52 N Padd St” (Paddington Street). The baptism register also recorded Henry’s date of birth: “1836 22 Jany”. This might appear to be an error, as Henry’s parents were not married until 15 July 1836, at Stoke Damerel in Devon. However on the 1841 census Henry was said to be 5 years old, and he was 15 when the next census was taken ten years later – ages which fit with the birth date entered in the St Marylebone baptism register. The censuses of 1841 and ’51 do of course reveal more about the young Henry Atcherley’s life. Before his baptism at St Marylebone he was born at Canterbury, Kent, and by 1841 was living with his parents at Durnford Street, East Stonehouse, Devon (the site of the Royal Marine barracks, and about a mile and a half from Stoke damerel church). By 1851, Henry’s father was dead and he was living with his mother at Walcot, which was then on the outskirts of Bath in Somerset. Henry had certainly moved around a bit in his first 15 years! And as we have seen, his travels were far from over. It is beyond the scope of this story to recount the history of the Māori Wars – or the New Zealand wars as they are now known – in depth. This series of armed conflicts was sparked by the takeover by European settlers or Pākehā (through purchase or otherwise) of traditional Māori lands on New Zealand’s North Island during and after the 1840s. (South Island, in the words of the New Zealand History website, “had never had many Māori inhabitants” so settlers and their sheep were able to spread across the island without any major resistance.) Various clashes in the 1840s were followed by “a decade of uneasy peace” through the 1850s. By the end of that period however, there were more Europeans than Māori in New Zealand – but 80% of North Island was still held by Māori. For the British, “Acquiring Māori land – especially land that Pākehā chose to see as unoccupied ‘waste land’ – was now a key policy.” Māori, meanwhile, had largely (but by no means completely) united behind a single King with a view to opposing the sale of their land. Further outbreaks of hostilities between Māori and settlers were, it would seem, inevitable. The first of them – the Taranaki War – began in 1860 and ended, with a truce but no resolution, in 1861. Then, in 1863, Māori were given an ultimatum by Governor Grey of New Zealand to pledge allegiance to Queen Victoria. When this was not forthcoming, British forces invaded the Waikato in July. Shortly after this, as we have seen, Henry Mount Langton Atcherley and nearly 500 other men from Victoria, Australia, joined the fray. Specific details of what Henry did during the New Zealand Wars are hard to come by in any quantity. It is stated that he saw active service at Te Ranga, Opotiki, Te Akeake / Akeake Tauranga, Whakamarama, Purako, Rotorua, Waimana, and Whakatane during a period of service (as a Colour Sergeant with the 1st Waikato Militia or Volunteer Regiment) from 18 August 1863 to 18 December 1866. In that time, according to the application Henry later made for the New Zealand War Medal, he was “actually under fire or conspicuously distinguished himself” on 21 June 1864 and had in addition taken part in 13 skirmishes, so that he was under fire 14 times in all. I INFORMED your Lordship in my last Despatch that I had made arrangements for removing the troops not required for the defence of Tauranga to Auckland, and accordingly, on the 9th ultimo, Her Majesty’s ship ‘Esk,’ and the steamer ‘Alexandra,’ proceeded to Tauranga for that purpose. Before their arrival, however, intelligence had been received at Tauranga that the rebels were assembling in force in that neighbourhood with the avowed intention of attacking our position, whereupon Colonel Greer, 68th Regiment, whom I had left in command, suspended the embarkation of the troops, and, in my absence on the Waikato Frontier, reported the state of affairs to the Governor of New Zealand, who immediately reinforced him with 280 Waikato Militia. After the arrival of this reinforcement, the force at Colonel Greer’s disposal amounted to 1500 men. I HAVE the honour to report, for the information of the Lieutenant-General Commanding, that I marched out of camp with a force, as per margin,[ 3 Field Officers, 9 Captains, 14 Subalterns, 24 Serjeants, 13 Buglers, and 531 rank and file] this morning at eight a.m. I found a large force of Maories (about 600) entrenching themselves about four miles beyond Pukekmahina, they had made a single line of rifle pits of the usual form across the road, in a position exactly similar to Pukekmahina, the commencement of a formidable pah; having driven in some skirmishers they had thrown out, I extended the 43rd and a portion of the 63th in their front and on the flanks as far as practicable, and kept up a sharp fire for about two hours, while I sent back for reinforcements, as per margin [1 gun, 220 men]; as soon as they were sufficiently near to support I sounded the advance, when the 43rd, 68th, and 1st Waikato Militia charged and carried the rifle pits in the most dashing manner, under a tremendous fire, but which was for the most part too high. The war in New Zealand, storming rifle pits at Te Ranga, June 21, 1864. The confiscation of Māori land in Tauranga has been the main reason behind the grievances that have been the subject of debate and discussion for decades and it is only in recent times that the work of the Waitangi Tribunal has finally led to the settlement of those grievances. Far from being regarded as patriots defending their lands Māori were instead branded as rebels and under the pernicious Native Settlements Act of 1863 had their lands taken from them for that reason. For some the injustice of what happened still grates. It is an extraordinary expression of a generosity of spirit that Māori have been able to move past the maemae, the hurt and suffering of their forbears to be able to participate fully in this commemoration. Nga mihi aroha ki a koutou. Picture credits. 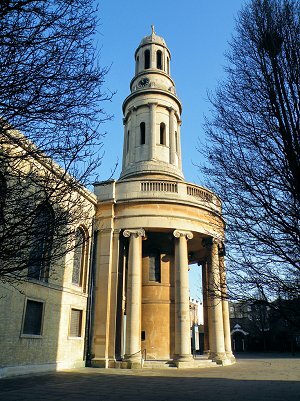 St Marylebone church: Photo by R P Marks, taken from his Flickr photostream and used under the terms of a Creative Commons licence. Action at Te Ranga, 21 June 1864: Painting by Henry Mount Langton Atcherley, copyright expired; adapted from an image at the Australian War Memorial website. 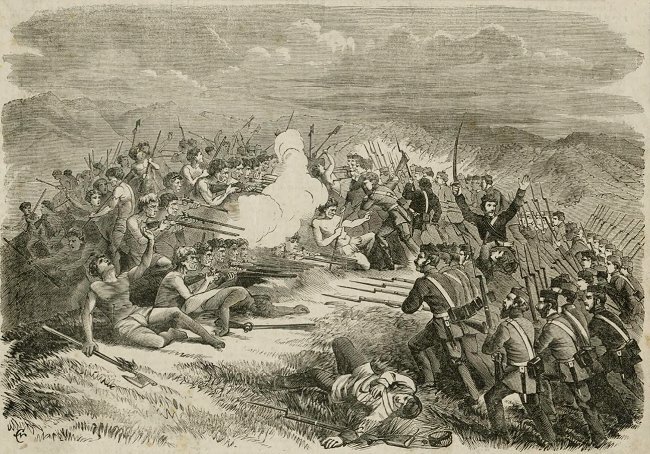 The war in New Zealand, storming rifle pits at Te Ranga, June 21, 1864: Drawing by Chevalier from a sketch by G. Lewis; out of copyright; image taken from Trove. New Zealand (War) Medal: Photo by Wikimedia Commons contributor Hsq7278; taken from Wikimedia Commons and adapted, used, and made available for re-use under a Creative Commons licence. London Gazette, issue 27410, 25 Feb 1902, page 1238. St Marylebone, Westminster, baptism register covering 1837. Entry dated 30 August for Henry Mount Atcherley. Copy viewed at Ancestry – London, England, Births and Baptisms, 1813-1906. Stoke Damerel, Devon, marriage register covering 1836. Entry dated 15 July for “William Shairp Langton Atcherley of the Parish of East Stonehouse a Bachelor and Elizabeth Hester Isabella Loftie of this Parish a Minor”. Copy viewed at Findmypast – Devon Marriages. 1841 census of England and Wales. Piece 276, book 1, folio 7, page 8. 1851 census of England and Wales. Piece 1943 folio 183 page 13. Otago Witness, issue 2332, 10 Nov 1898, page 39 et seq. “Incidents and sketches of the Maori Wars”. Copy viewed at Papers Past. New Zealand’s 19th-century wars: Page 2 – Pre-1860 conflicts; Page 3 – Taranaki and Waikato wars. At: New Zealand History website (accessed 20 Apr 2018). 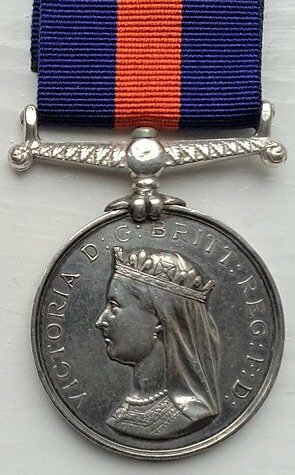 BRITISH MEDALS (The Kuriheka Collection), Lot 171, 29 Jun 06. At: Dix Noonan Webb website (accessed 19 Apr 2018). Una Platts (1980), Nineteenth Century New Zealand Artists: A Guide & Handbook. Digital text of entry for Atcherley, Henry Mount Langton viewed at New Zealand Electronic Text Collection. Archives New Zealand, Wellington Office, Maori War Series files, Item ID R22349315: Atcherley, Henry Mount L. Indexed at Archway. Information abstracted by Erin in a volunteer look-up. McCauley, Debbie (2014), Battle of Te Ranga (21 June 1864). At: Tauranga Memories website (accessed 21 Apr 2018). Brett Payne (2011), Colvile’s Story, Part 3: Massacre at Te Ranga. At: Photo Sleuth (blog, accessed 21 Apr 2018). Quick History. At Battle of Gate Pa website (accessed 21 Ap 2018). London Gazette, issue 22894, 16 Sep 1864, pages 4451, 4452 and 4453. Rawiri Puhirake. At: Wikipedia (website, accessed 21 Apr 2018). Tauranga 1864. At: The New Zealand Wars website (accessed 21 Apr 2018). New Zealand Government (1871), Papers Relative to the Award of the New Zealand War Medal. Page 4. PDF copy viewed at Papers past: Parliamentary Papers.